ln their simplest form a boiler is a round tank of water with a fire underneath and in the case of my first engine (designed in 1967 by David Parker) it is little more than that. What we can do with these little boilers is to improve on the material normally used on model locomotives and to look at just how big a safety factor we really need. Model locomotives sometimes have a boiler shell that is twenty, thirty, even forty times stronger than it needs to be! ! The modern aircraft which we happily board and in which we fly away on our holiday works very safely on much lower factors of mechanical strength than forty to one! It is really quite safe to use a factor of four to one on a boiler of only 50 mm diameter which operates at perhaps 150 C. David's 'Comet' engine (see photograph and drawings) has a quite generous safety factor of 5:1 and the boiler is free of any long term danger due to corrosion. The boiler is made of 0.5mm nickel silver sheet, silver soldered with very simple water tubes of 6mm copper to increase its heating surface. lt is spirit fired and l hydraulically tested mine to 3 times the working pressure with no problems, it worked consistently for over five years. 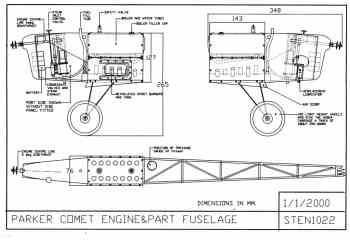 My experience with 'Comet' has led me to believe that it is perfectly feasible to build a model speed boat engine along similar lines as the airborne engine. Add reversing gear and a throttle valve and you could build a fast planing steam boat that is quiet, controllable and above all absolutely unique.. 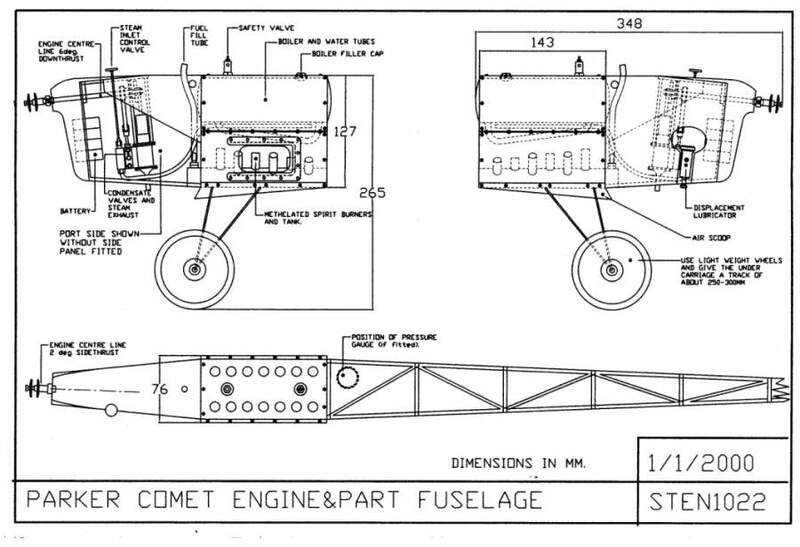 This is not silly thinking, the Comet's engine directly coupled to a 12''x8'' propeller turns at 3200 RPM. and develops, a static thrust of about 600 grams. The weight of this engine and boiler is little more than a 540 size electric motor and a standard 7cell 1500 ma Ni/Cad battery pack. The fastest steam powered model boats in the world are the tethered flash steam hydroplanes which reach speeds of up to 170 kph this brings me to a different kind of boiler that offers huge improvements in performance for model aircraft, the flash or Monotube Steam Generator. I have no complaint about Skylark, I launched her in the Chichester Ship Canal in April 2003 and everything operated much as the previous owner had said it should except, try as I might all I could get was 25psi and a slow walking pace. I was told that Skylark steamed well at 80-100psi and produced enough power to run at full hull speed which should be say 3.5mph, a fairly good walking pace. That is, it did when it had a monotube. I tried all I could to get that bi-tube to operate but it would not play ball. The previous owner gave me his bi-tube pressure equalising valve along with Skylark when I bought her and I experienced no sign of overheating of one tube with the other tube running much cooler. I can look down the funnel straight into the flame area and if anything is red hot I can see it at once. My impression is it did divide the flow exactly as intended. All I got was 25psi. After a few weeks I gave up and made a new monotube from the self same two 20 foot (6.1 M) lengths of 3/16" (4 mm) Kunifer (copper alloy) brake pipe. They were joined with a screwed compression joint some way up the chimney out the way of the direct heat of the flame. Result, 60 psi whoopee progress! I do not think it was the bi-tube as a device that was the problem, my firm belief is that by switching from bi-tube to monotube I had DOUBLED the velocity of the feed water through the 3/16" (4 mm) Kunifer tube. This matter of water velocity has been discussed in the book "Experimental Flash Steam", it is so relevant to these notes that I have included the results in my table, I quote verbatim from the book:-. Quote from Experimental Flash Steam, by Benson and Rayman my copy being published by Model Aeronautical Press Ltd. The Experiments themselves were carried out by Mr Edgar T Westbury one of the most well known writers and designers of model engineering projects in UK. He is known the world over, the world of model engineering that is; (not a very big world!). Page 59. “Tests carried out on three copper boilers each 11 Feet in length and 3/16" (4 mm), 1/4" (6.3 mm) and 5/16" (7.9 mm) diameters respectively and with a wall thickness of 0.03" (0.7 mm). Each coil was wound upon a circular tapered form, 2 1/4" (57 mm) inside diameter down to 1 1/2" (38 mm) diameter and spaced 1/8" ( 3.2 mm) apart. The casing left 1/8" (3.2 mm) gap at the largest coil. 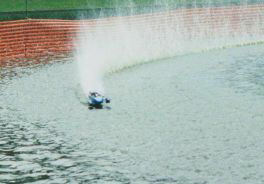 Water was fed from a water pump driven by an electric motor. Each boiler was fired by the same air-gas blowpipe 1 7/8" (48 mm) diameter, and various evaporation tests were conducted with a spring loaded outlet valve set to blow at 500psi. In each test the 3/16" dia. boiler gave the best results and on a maximum evaporation test managed 27 cu. Inches per minute with the gas blowpipe flat out and the steam highly superheated. This represents about 1 lb per minute and seems a remarkable figure for only 11 feet of tube and the fact that this boiler had the lowest heating surface. In every test the 5/16" boiler gave the worst results. On repeating the experiments using thicker walled tube the relative results were confirmed but evaporation increased by about 12%! End of quote. E.T. Westbury's test results on 3/16" tube is included in the table which follows. SO what is going on? 60lbs of highly superheated steam per hour from about 1/2 sq. ft heating surface! It must be said at once that this sort of hard driven performance is VERY wasteful of heat using only a few hundred degrees Centigrade from the flame. A Gas-Air torch typically burns at about 2200º C at the flame cone. A thin piece of steel wire at the outlet to my tiny boilers glows red, about 800-900 C. We do not want red hot exhaust on a steam boat and I certainly do not get it on Skylark. Why is velocity so obviously critical in the performance of monotubes? The previous owner of Skylark has a theory which I believe to be correct. As the water flows and heats at some variable point along the tube it begins to form tiny steam bubbles on the inside wall. These must tend to stick to the surface just as they do to the bottom of a saucepan when you boil water in it. The steam bubbles seem obstinately glued to the metal. In order for a monotube to operate efficiently the water must flow fast enough to scour bubbles away IMMEADIATLY they form. The conductivity of any vapour is thousands of times worse than water and maybe 100,000 times worse than copper alloys like Kunifer. If as I believe the dramatic increase in performance is due to the increased water velocity then I thought maybe I can juggle a few numbers and come up with a very interesting, if empirical figure that represents a likely MINIMUM velocity to aim for when designing very small monotubes like Skylark's Monotube and the really tiny tubes I have in Tiddler's Monotube. Another result of this scouring is that scale and oxides do not form on the inside of the tube. Indeed if you cut open a well used section of a monotube you will see that the inside surface looks as if it had been lightly etched. I could have directly compared the results of the bi-tube and monotube and left it at that but in addition to Westbury's 3/16" diameter tube experiment, a further source of data is available in an article published in the Model Engineer magazine in 1992. This was written by Bob Kirtley covering in great detail the construction of his world record breaking hydroplane Pisces II which raised the Class B Steam record from about 80 mph to 104 mph in one step. I have seen her go and it is a joy to behold, the noise is like no other, music to my ears and any other Monotubist's. What I did was to compare directly the water velocities of the four separate cases and tabulate them as follows. The different values for Monotube area (Ma) for Pisces and Westbury are because of the differing tube wall thickness. It was with smug satisfaction that I noticed the close tally between Skylark and the Westbury test data. To other Monotubists everywhere please give me the current particulars of your system so we can acquire a data bank for future use by others. All the tabled parameters plus pressures, temperatures, fuels, burners anything you can think of that may help others who will follow on after us. I don't pretend that my observation and experience is a scientific study but it may prove more concrete than any other data that I have seen to date. It is further born out by the fact that if I slowly reduce the heat input setting on Skylark there comes a point at about 50 psi when the pressure drops very quickly from 50 to 25 psi; without a commensurate reduction in fuel flow. 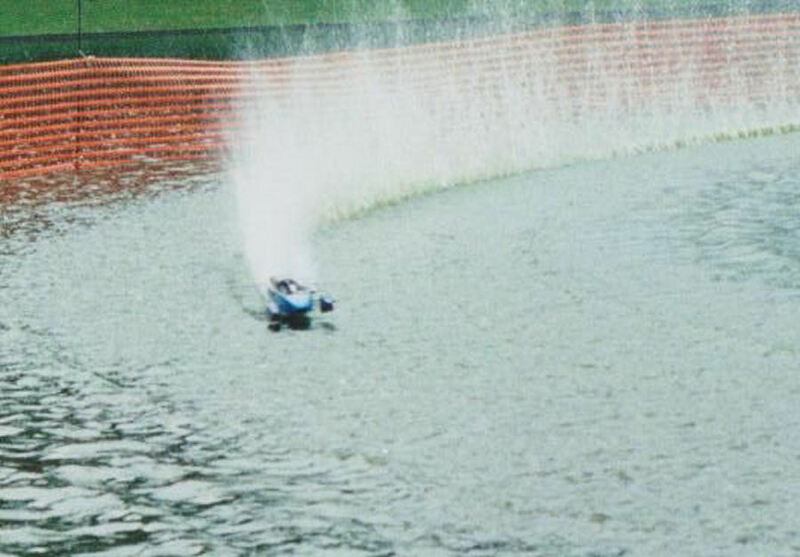 With the available data I would suggest that anyone contemplating a small monotube design for normal cruising speeds and pressures a WATER INPUT VELOCITY of about 50 metres per minute (0.8 Metres per second) should be a safe minimum to aim for at the systems normal 'cruising' power. This study, whilst interesting may be of very limited use much outside of the tube diameters in the table, I would hazard a guess that all would be well up to 3/8" (9 mm) bore tube. I have done some calculations on turbulant flow at the temperatures and pressures at which Skylarks monotube normally cruises and it seems to be that turbulent flow will occur at all the water flow rates we are likely to work at and it is unlikely to fall outside that rule of Thumb up to maybe 3/8" (9 mm) bore. More is needed in this arena to prove anything. It may just be that in full size practice perhaps the known point of turbulence is the lower end of any particular monotube's efficient and useful working range. Do we have a proffessional Monotubist out there ready to help us? Pisces has a water velocity twice that in Skylark and produces at least eight to ten times the power. 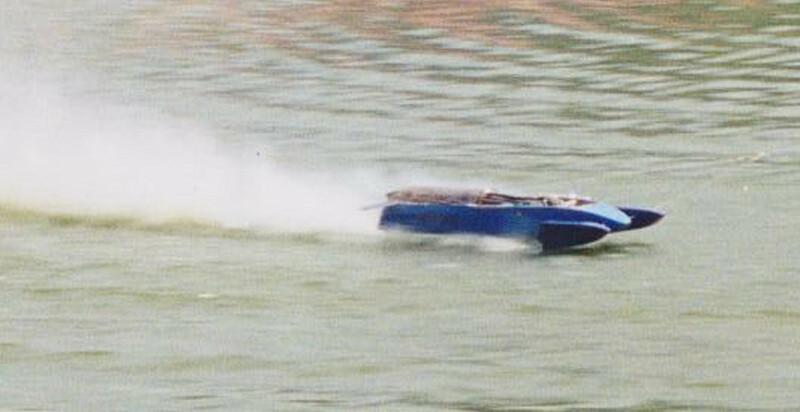 I know this because Class B boats have similar rules be they Steam or IC Powered, the IC boats are usually fitted with 30cc racing two stroke glow motors which are known to be capable of 5 HP. A point I must make here Bob Kirtley's engine has a displacement of 13cc and yet has a performance comparable with 30cc IC engines!. A good steam Hydro is not that much slower than an IC boat and yet is generally 2-4 lbs heavier. I doubt if Skylark needs more than half a horse power to drive her as she goes at the moment. This brings me to the question of tube length. The longer the tube, the more heating area = greater efficiency. Yes, but there are limitations and in small sizes pumping effort is a very significant such limitation. I want to try a feedwater heater section above the monotube in the smoke stack and because this area is unlikly to have boiling water in it, feedwater velocity is of much less significance. This then permits the use of bigger bore tube for the feedwater heating section of the system which will help with reducing pumping effort. I appreciate that there is NO WAY of predicting where along the tube the water actually boils however since the exhaust temperature at the chimney top is only about 300 C. and boiling point at 100 psi is about 150 C. it is far less likely to boil water at that point than right in the fire. THE RELATIVE MERITS, FLASH OR CONVENTIONAL BOILER? Conventional boiler merits. 1. The containment of a mass of heated water makes power control as simple as a carburettor on an IC engine. 2. The complications of pumps and pump control on a flash plant make the conventional boiler more reliable especially in the smallest sizes. 3. Pressure control in a heated pressurised tank, using a safety valve is essential for safety and very useful when throttling with a simple valve. 4. The pressure controlled tank of heated water is a store of instantly available energy in its latent heat. This latent heat is the source of the destructive power of a conventional boiler explosion. Disadvantages. 1 . Requires regular pressure testing. 2. ls heavier than any self respecting flash unit of the same power. 3. Limited in its capacity to safely contain very high pressures and temperatures 4. Difficult to fly inverted. 5. Generally a lower thermal efficiency than a flash plant. At some future time I will also go into details like how to automatically control steam temperature (it is perhaps more important than the pressure). The likely limits to power up to the 3/8 bore to which the above table probably applies. Lubrication at the upper limits of temperature, the use of solid lubricants and posh oils. How to estimate a value for the real pressure inside the monotube, if indeed you want to know it. That is how I see small bore monotube design and is as far as I have taken it to date January 2007. More will follow as I have notes, pictures and drawings to make up perhaps a further 20 pages but the pay is not good and the workshop beckons at every idle moment but there will be additions to these pages as time permits.